Not much to report this week. I got some work done on my Cadians, but I only completed my Platoon Command. I will keep working on them over the Thanksgiving holiday. I have completed my Cadian Platoon Command Squad. 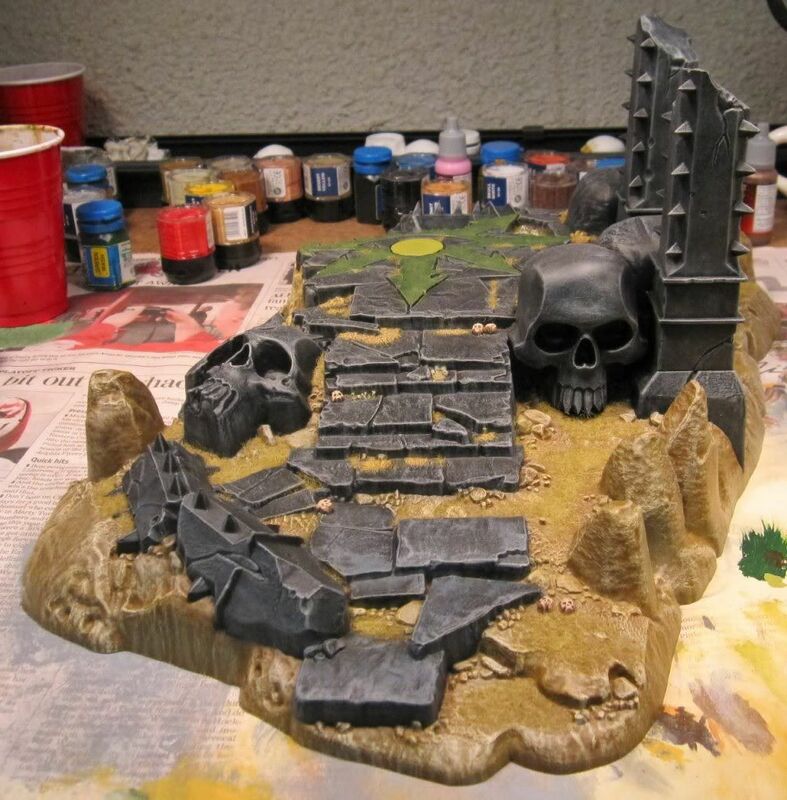 This is just a list of my completed terrain pieces. 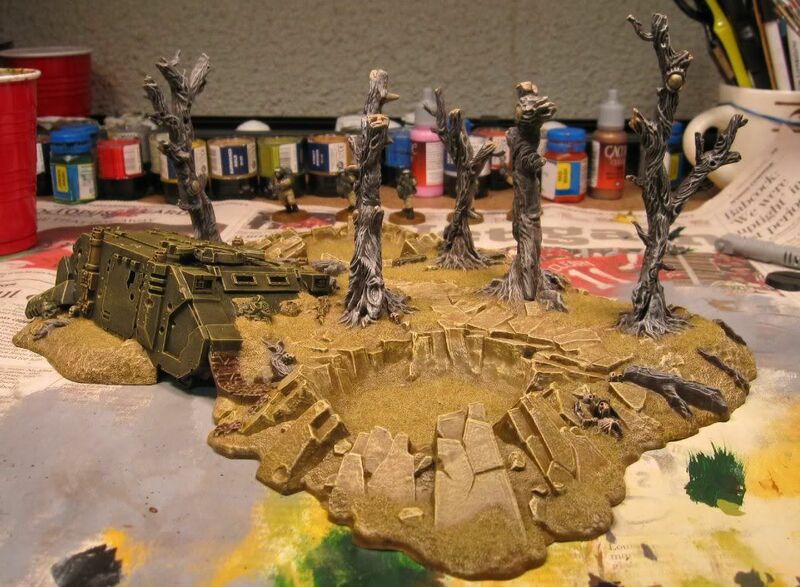 My fourth terrain piece completed in four days. 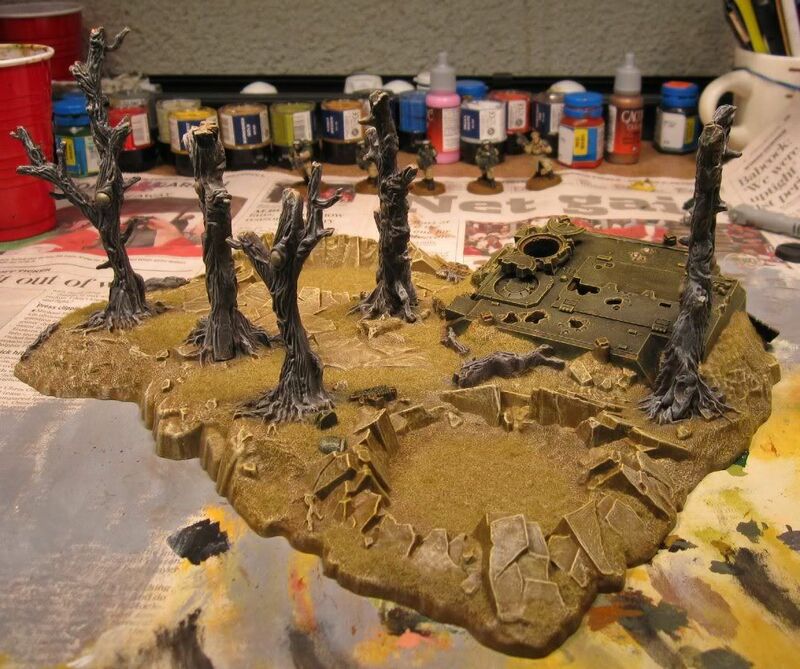 Another piece of terrain completed. It just needed a little detail work and some static grass to finish it up. 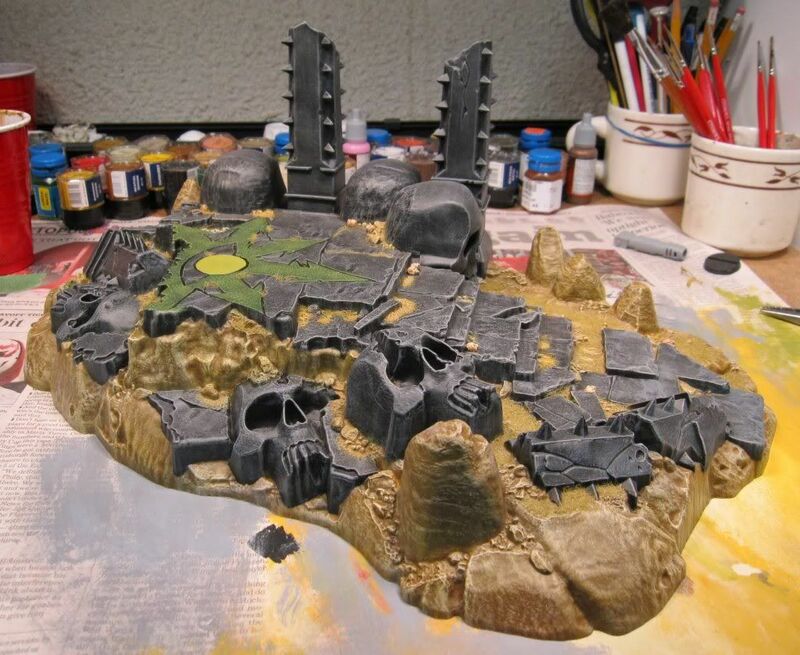 It is made from the base of the Arcane Ruins. 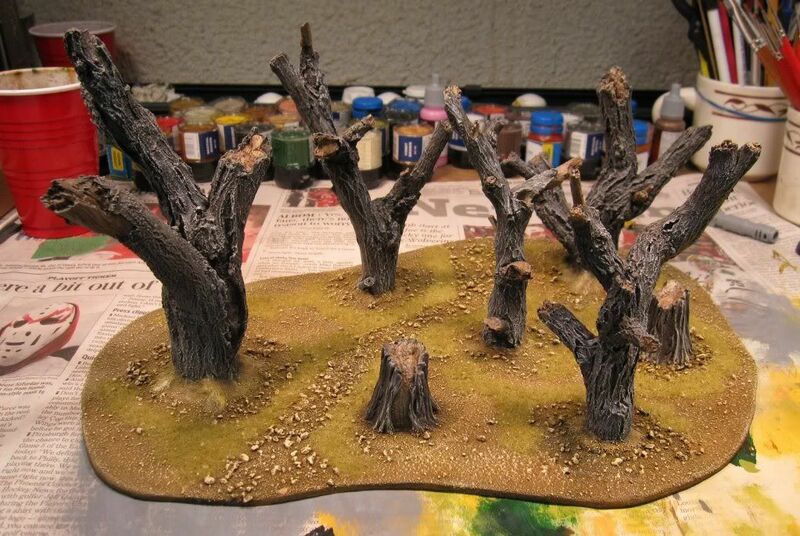 I finished another terrain piece, the Deadwoods. 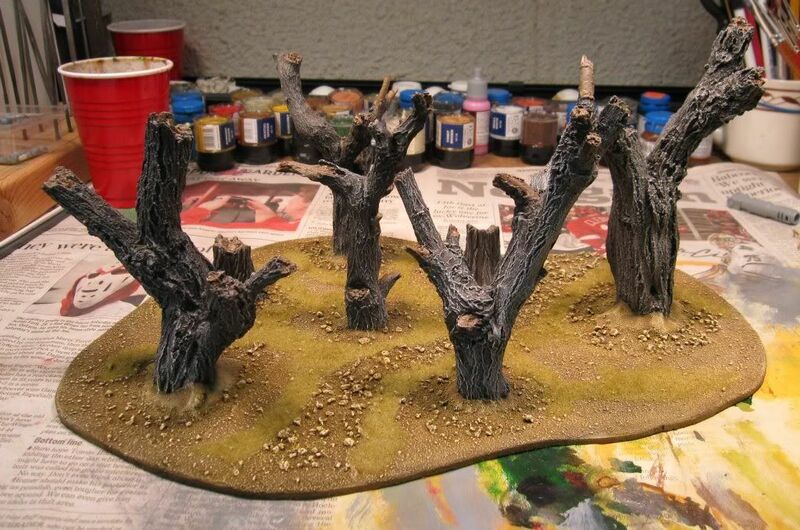 This piece is made of Armorcast dead trees and tree stumps glued onto a hardboard base. 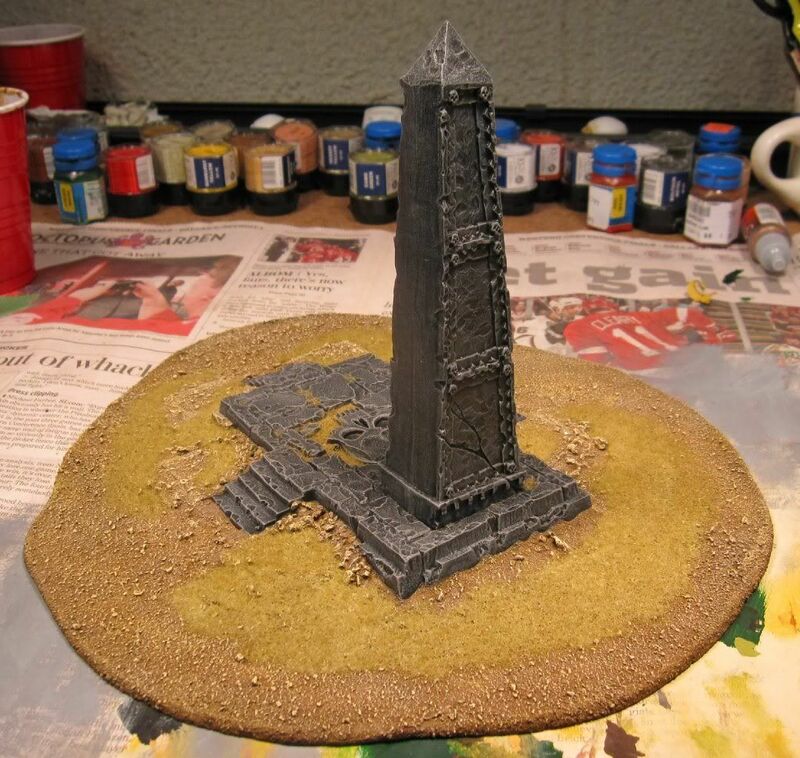 I glued sand and balast onto the base. After it was painted, I added some static grass. I have completed my Temple of Skulls. This is my first attempt using static grass and I think it turned out good. It gives it some unique character IMO. 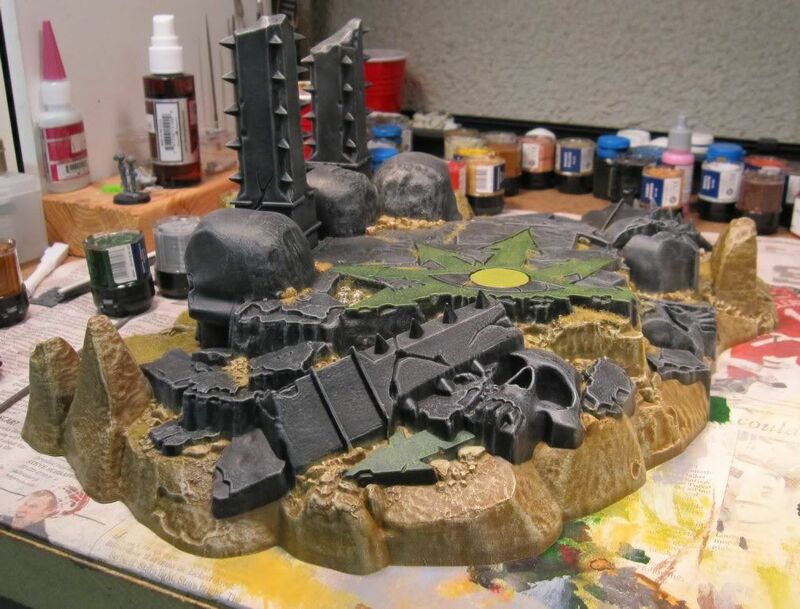 I have to say that I think this is one of the best, if not the best, terrain pieces Games Workshop has ever produced. 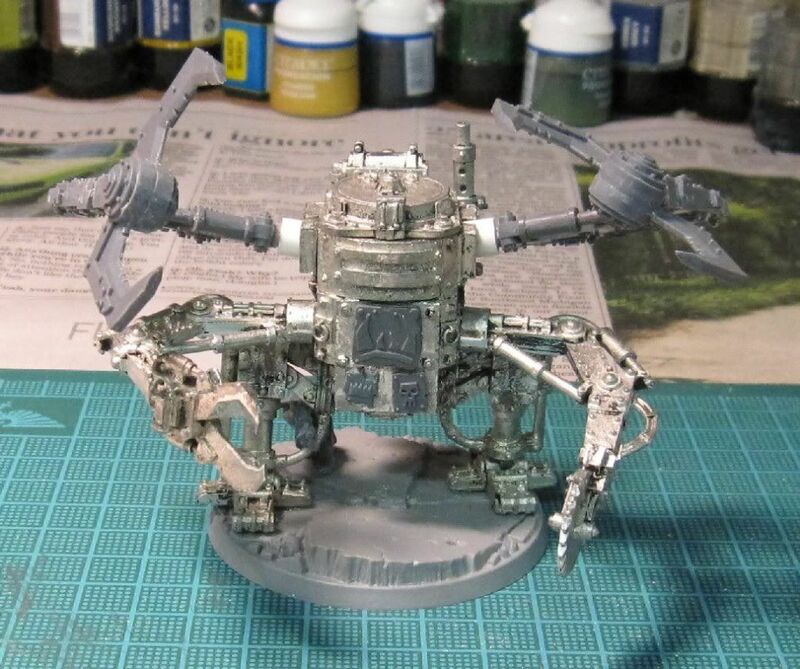 Even though it is a fantasy piece, I have used it in several 40k games and it works great. It was an objective in all my Planetstrike league games when I was defending with daemons and once when I was attacking. 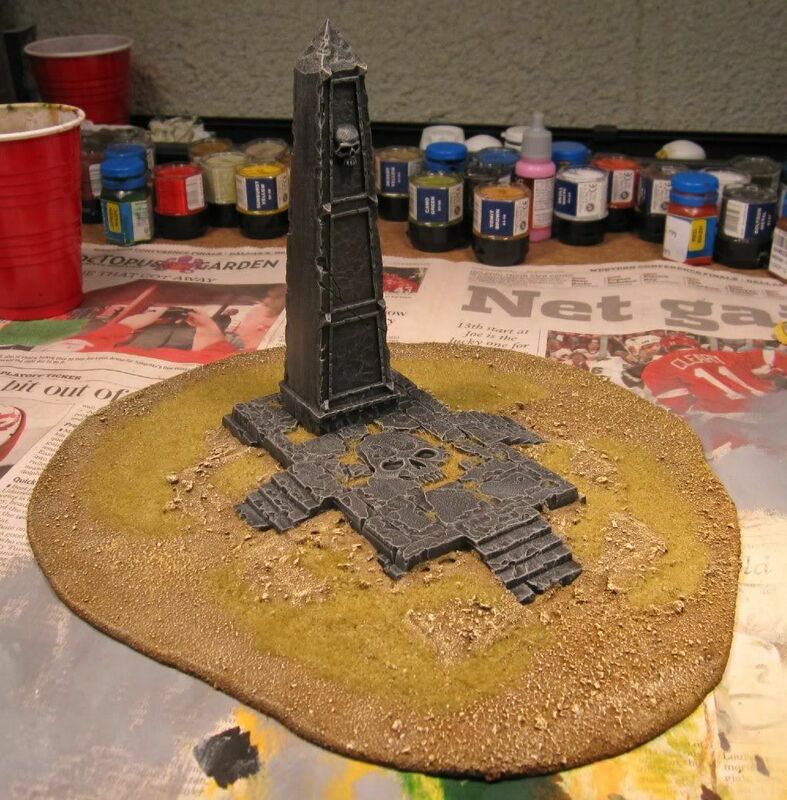 Although I did very little on my project list this past week, I did make some progress on my Temple of Pestilence. 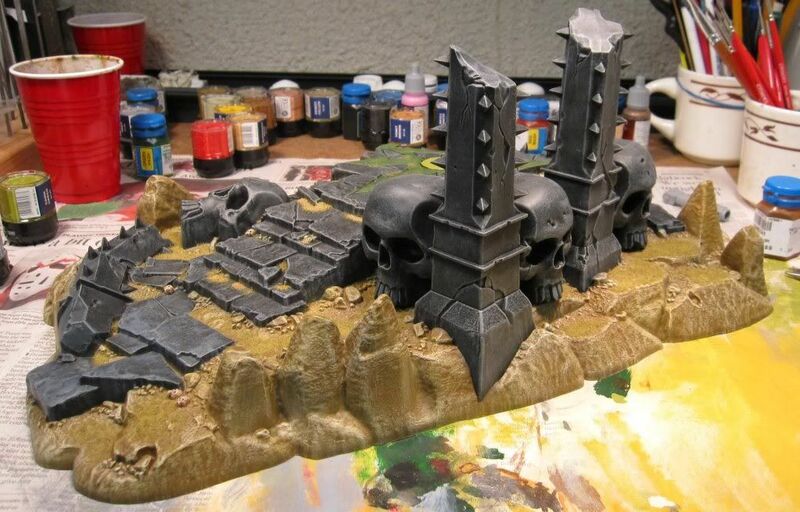 I am making sure to take my time with this piece as it will serve as a centerpiece for my daemon army and I want it to look nice. I currently have it about 90% painted, I just need to go back and do the detail work on it. 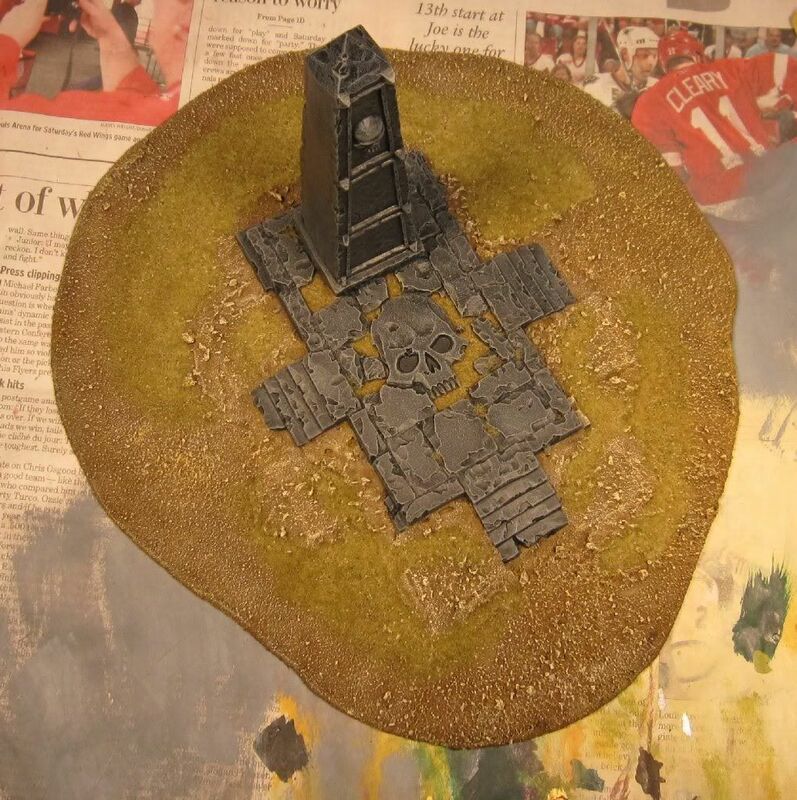 I am planning on experimenting with some static grass on this piece, including making patches of dead grass and putting some dead grass in the cracks between the stones. Some of my time last week was spent inventorying my armies and writing up my army lists for the blog. 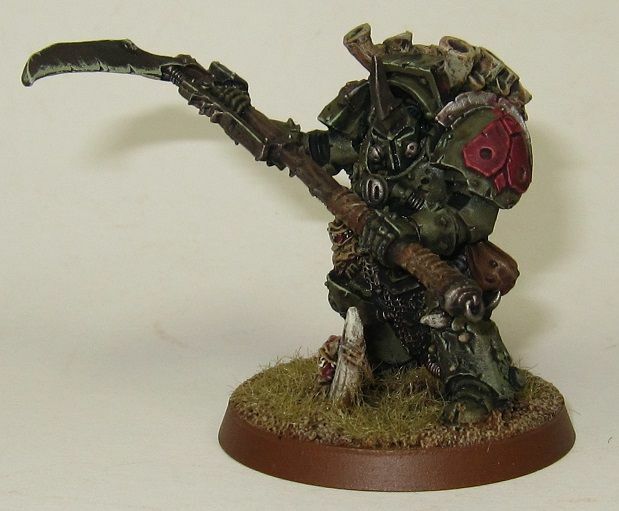 As I get projects completed, I plan to update the appropriate army list with pictures, eventually leading to a fully painted army list. 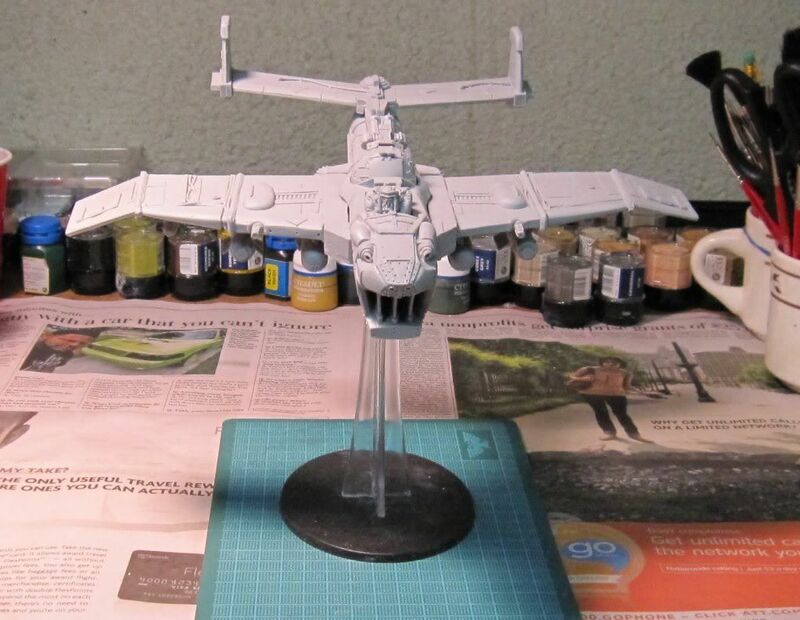 Also, since the weather was forecast to be very nice this weekend, I spent a bit of time during the week getting models ready to prime. 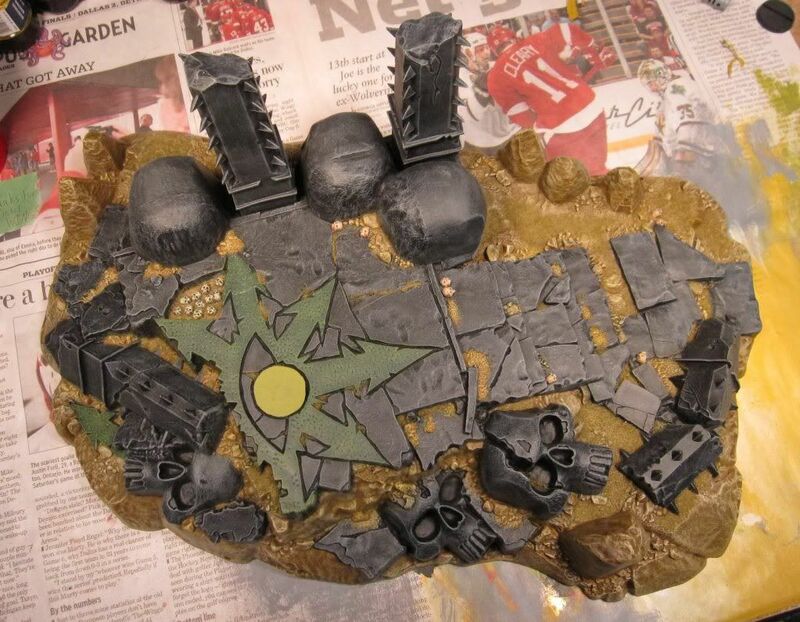 After a can and a half of primer, I got a fair bit of stuff primed, mainly Orks. 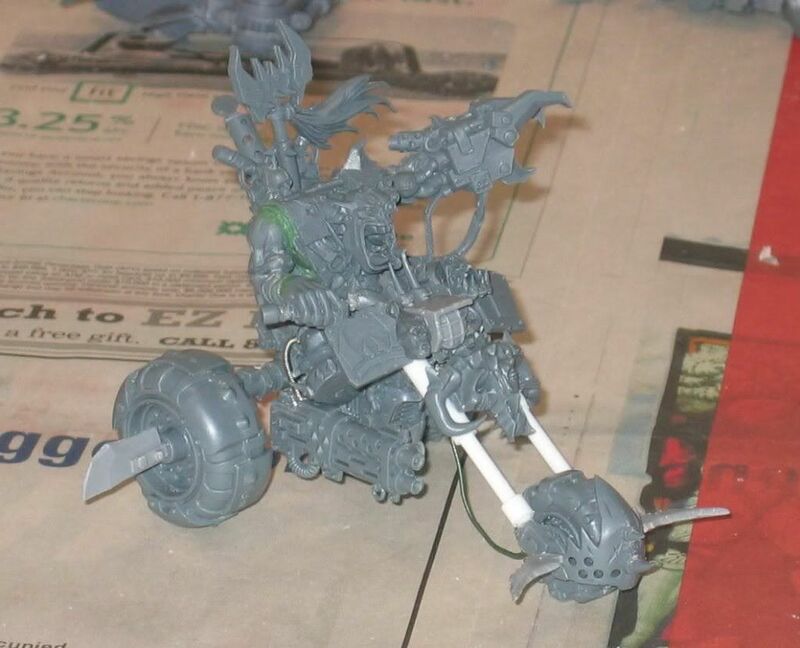 80% of my Ork army is now primed and ready for painting. 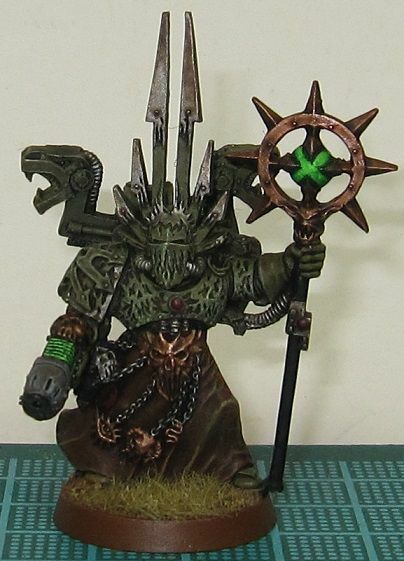 Now that the Planetstrike League is over, I am going to have to decide on which army to play in the next 'Ordo Fraternitas' league. It is not scheduled to start until early to mid January, so I have some time yet. 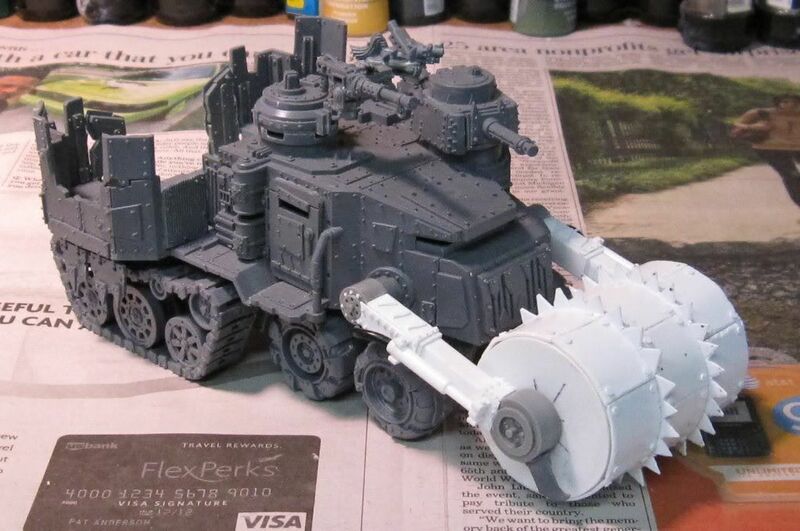 It is going to be either Orks or Cadians and that will be the next army to concentrate on. Nothing beats playing with a fully painted army. This is over a week late in posting, but better late then never. I wrapped up the OF Planetstrike league last Saturday (10/31) with both of my Round 4 games. My opponent this round was Necrons and the mission was Forlorn Hope. Game 1 was the quickest game of 40k I have ever played. 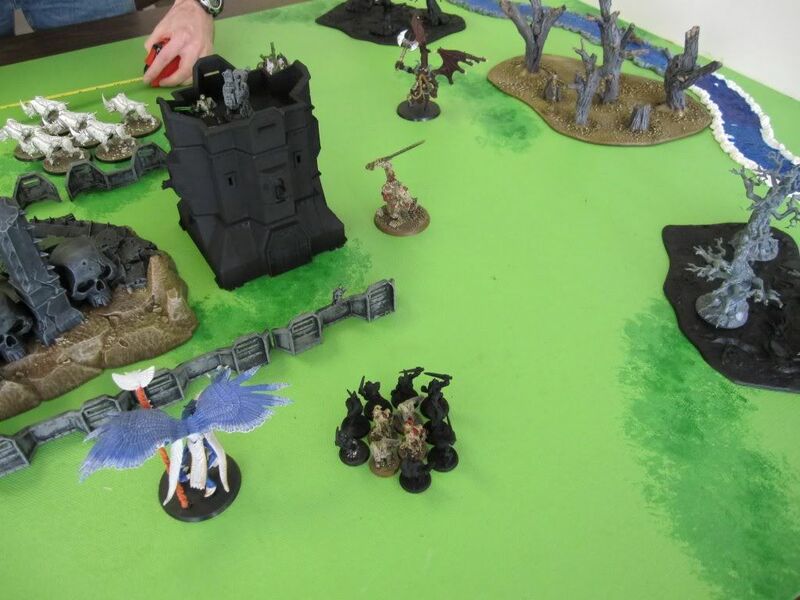 Since I always start with no units on the table, my opponent was able to get his Destroyer Lord and Wraiths on the tallest objective with the flag on turn one and I instantly lost. I knew I should have put a taller terrain piece on the table, but for some reason I didn't. Game two was a much better game. 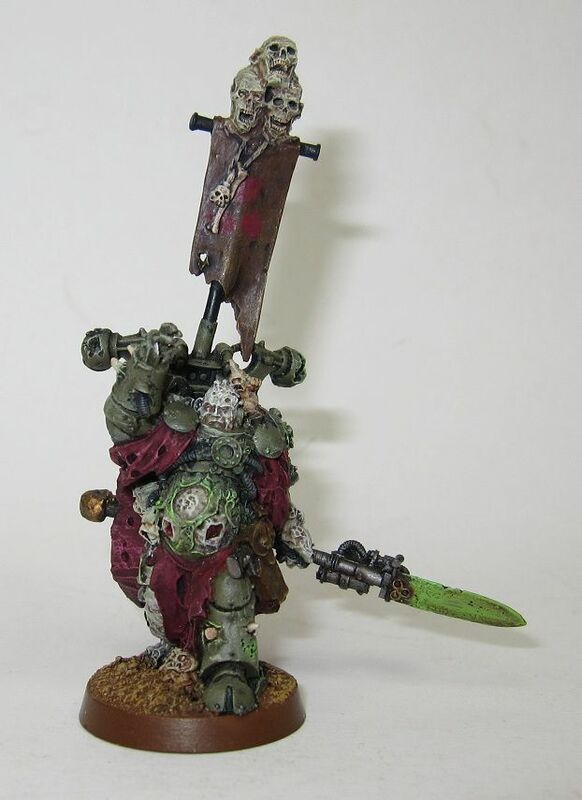 With a large unit of Plaguebearers carrying the flag, I was pretty confident that they would be able to hold onto it. Unfortunately, since I am writing this up a week later, the details are a little fuzzy, but I can cover the highlights, including the epic battle to bring Nightbringer down. The table was setup with two bastions flanking my Temple of Skulls. On turn one, the daemons arrive. 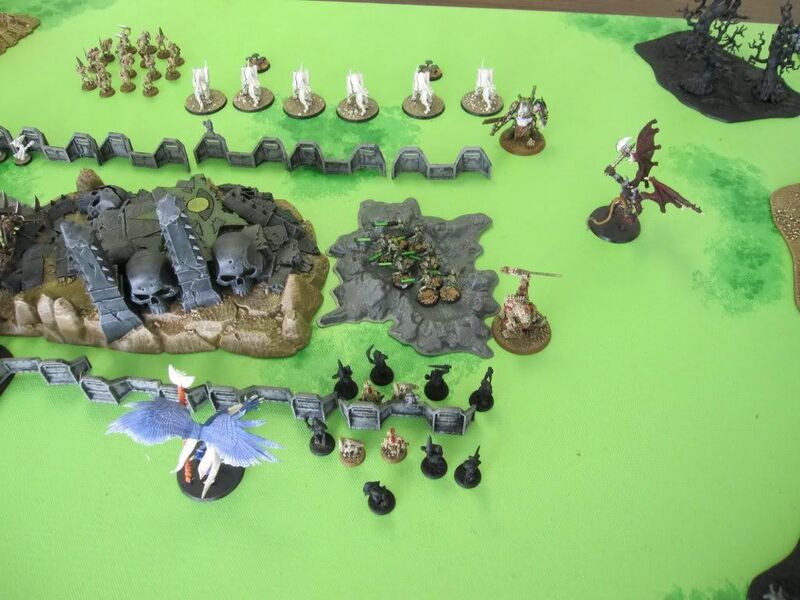 Everything but the Beasts of Nurgle and the unit of Plaguebearers with the flag arrived on turn one. Neither of these units arrived until they automatically came in on turn 3. Unfortunately, the beasts misshaped and were lost in the warp. The PBs with the flag landed right on top of the tallest objective, a risky move that won me the game. 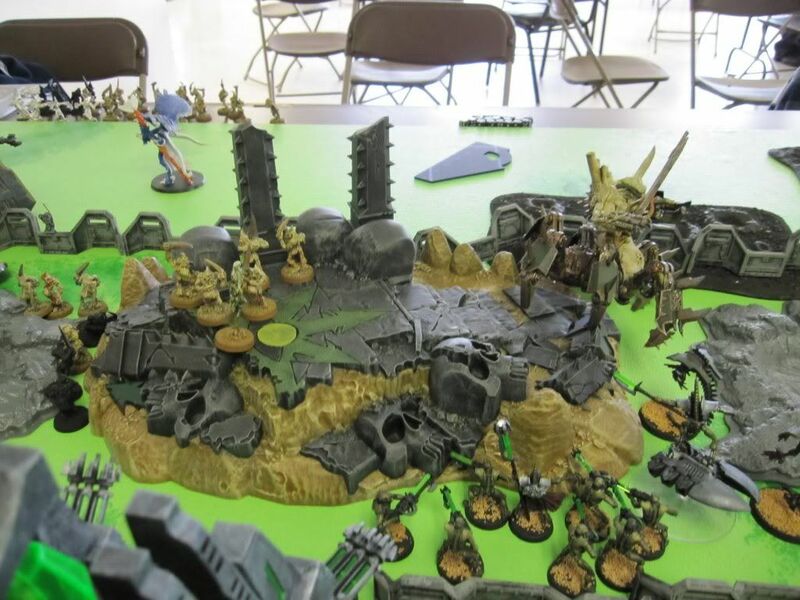 At the end of the movement phase, my opponent tried to surround the Bloodcrushers with drop pylons, but one pylon landed on the Flamers and was destroyed, the other landed on a piece of defense line and was destroyed. With some lucky rolls, neither bastion was standing at the end of the assault phase in turn one. 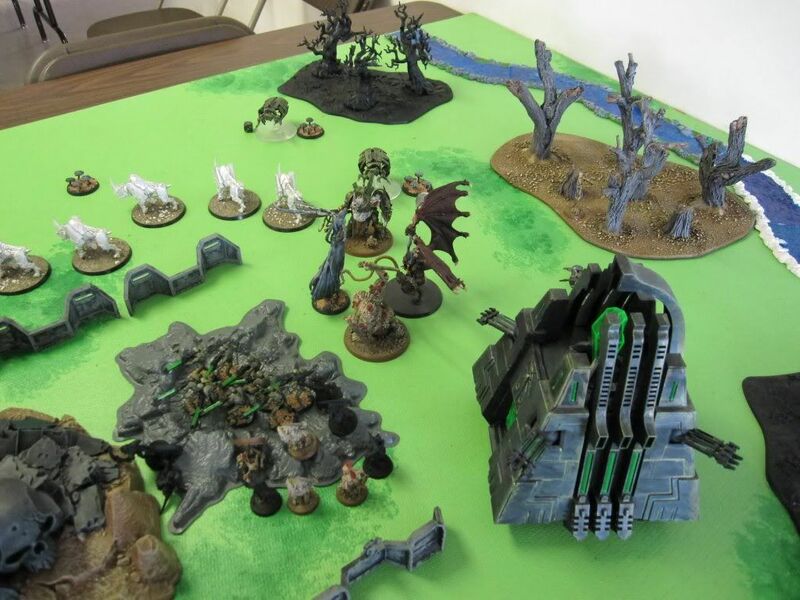 In turn two, the Necrons reenforcements began to arrive. 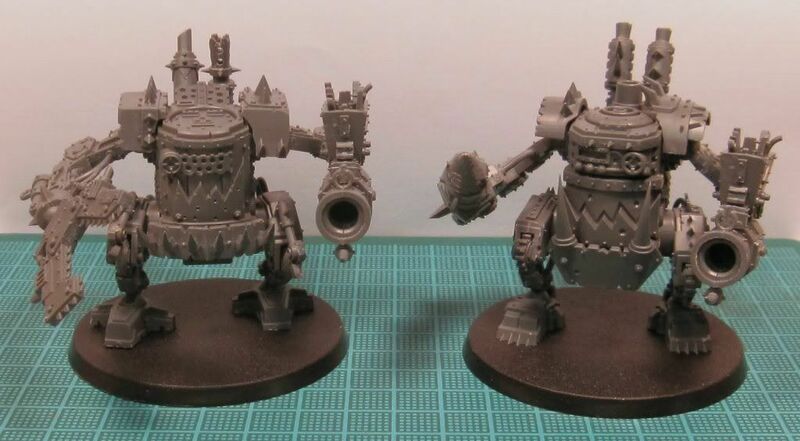 They quickly got to business and immobilized the Soul Grinder and killing all the Flamers. 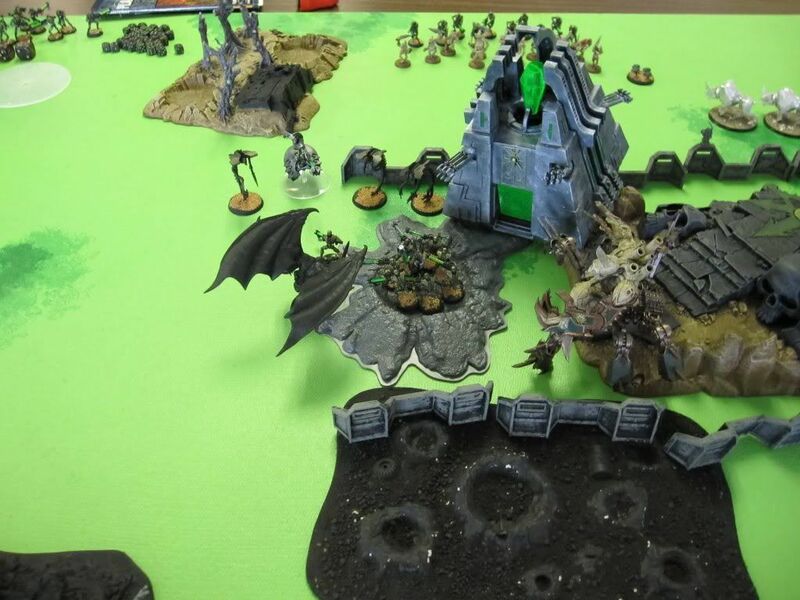 The highlight of the game was on turn two when the Bloodthirster, Great Unclean One, and a Daemon Prince of Nurgle all assaulted Nightbringer. Prior to the assault, the GUO used Breath of Chaos on him and managed to inflict a wound. In the assault, combat was lost by the daemons, and sadly everyone but the Bloodthirster made their fearless checks. That was the Bloodthirster's last wound and he was banished back to the warp. Things were looking dire for the daemons, but in the following opponent's assault phase, no one died and the combat was a draw. It was really the GUO who was doing the most damage to Nightbringer due to its Noxious Touch attack. 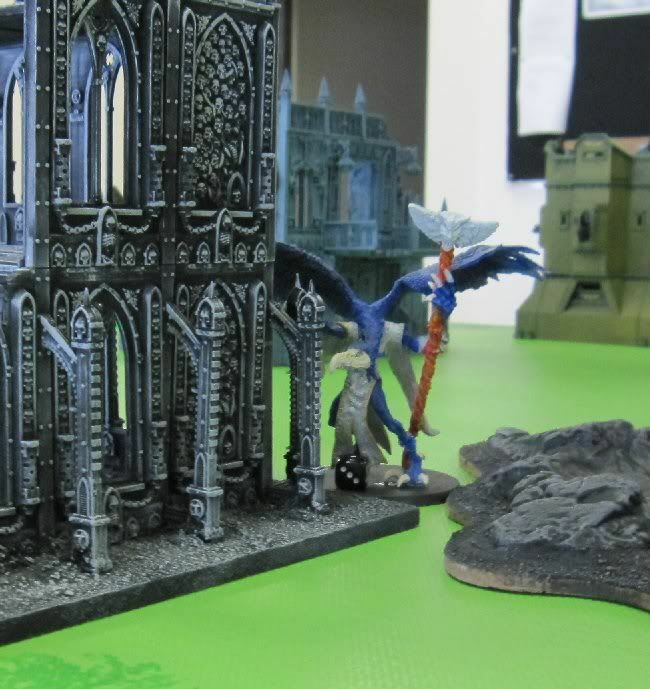 In the following turn, the Bloodcrushers came in to avenge the death of the Bloodthirster and they alone managed to bring Nightbringer down. It was quite an epic battle. The daemon prince managed to remain unwounded, but the GUO was down to one remaining wound. On turn three, the unit of PBs with the flag arrived, and landed right on top of the ruined temple. My opponent now had until the end of his following turn to either capture the flag or he would lose. He shot everything he had at them and reduced their numbers to just five models. 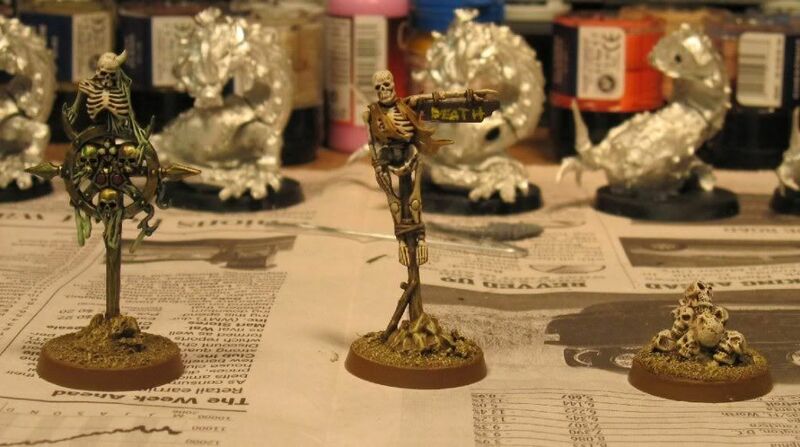 Before his shooting phase, his unit of wraiths with the Destroyer Lord was easily in assault range, but he killed so many of the PBs and I was removing the closest models to it that he missed the assault by just an 1/8". There was a slight dispute on the position of the closest wraith because the model had been placed on its side since it was in terrain where it was unable to sit flat, so we rolled off for whether it could assault or not and I won the roll off, thus winning the game. Overall, it was a great game. 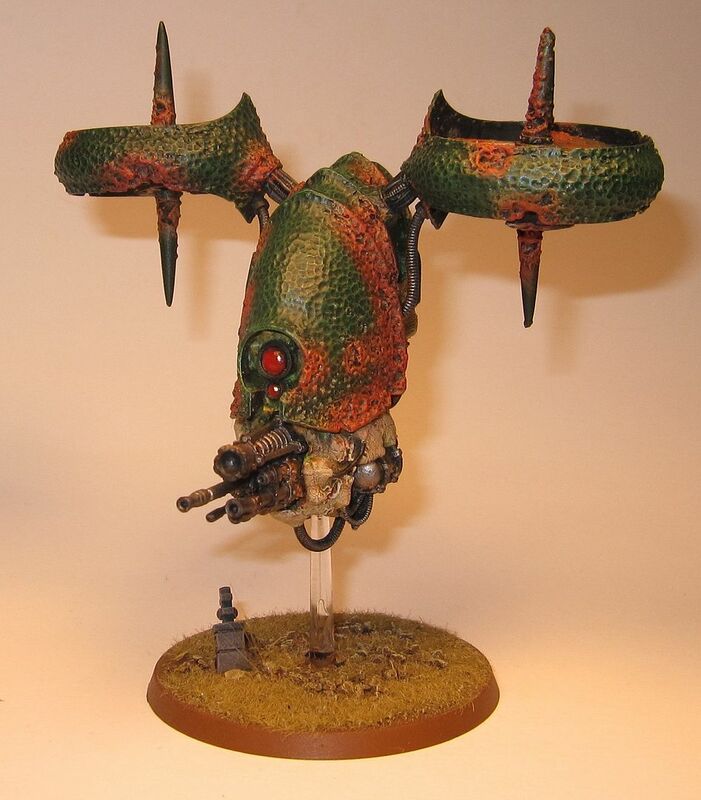 I really enjoyed the Planetstrike league as a whole, although playing daemons was a weird army to play as the defender. 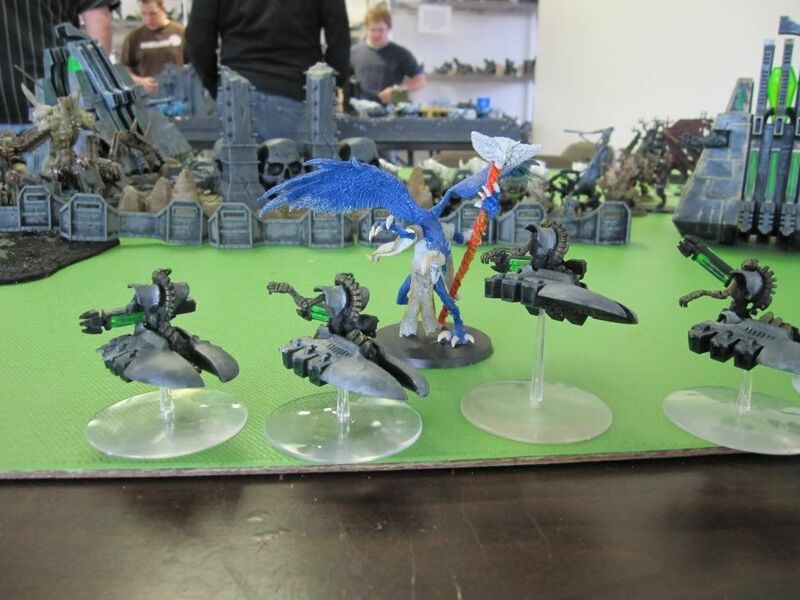 You ignore so many of the PS Deployment rules that it sort of felt like just regular games of 40k. 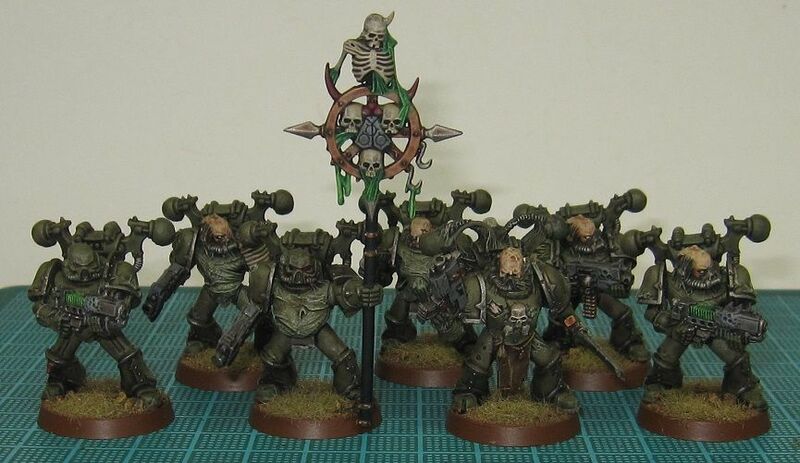 Hopefully there will be another PS league next year in which I can play my Cadians. Here is a list of completed project links. 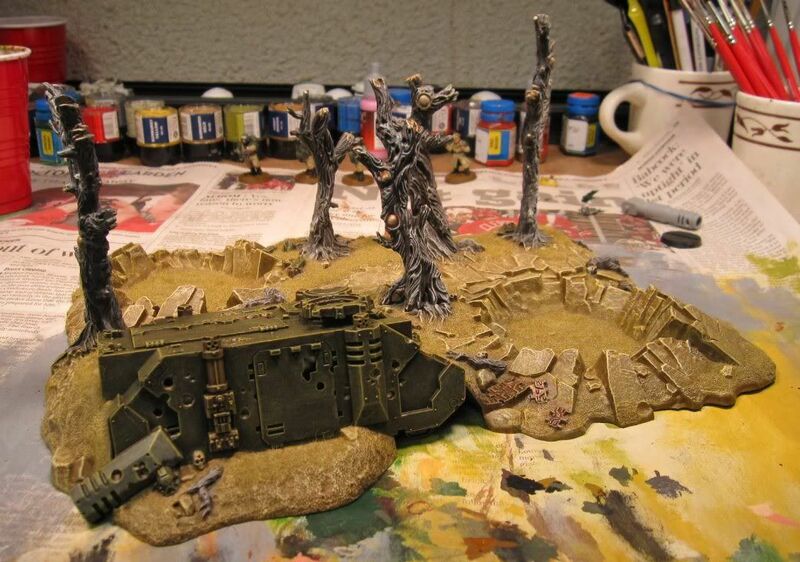 My first IG army was the 3rd Edition Steel Legion army that came out around the time of the Armageddon Campaign. I had fun with that army and they became my second favorite army. 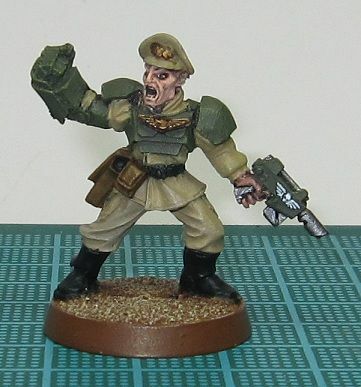 As soon as the plastic Cadian IG were released, I sold off my Steel Legion and replaced them with Cadians. 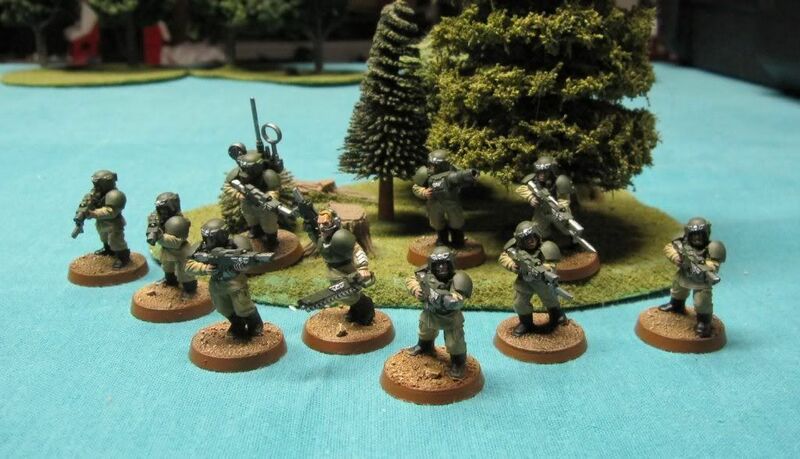 My Imperial Guard Army is the Cadian 8th Regiment. 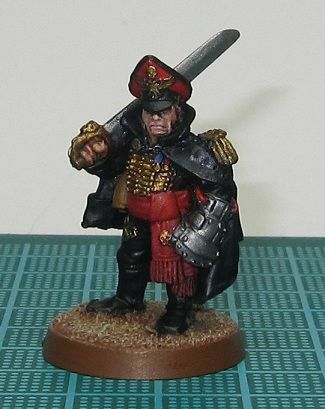 Normally I like to create my own history for an army, but I really like the history and flavor of this regiment too much not to use it. 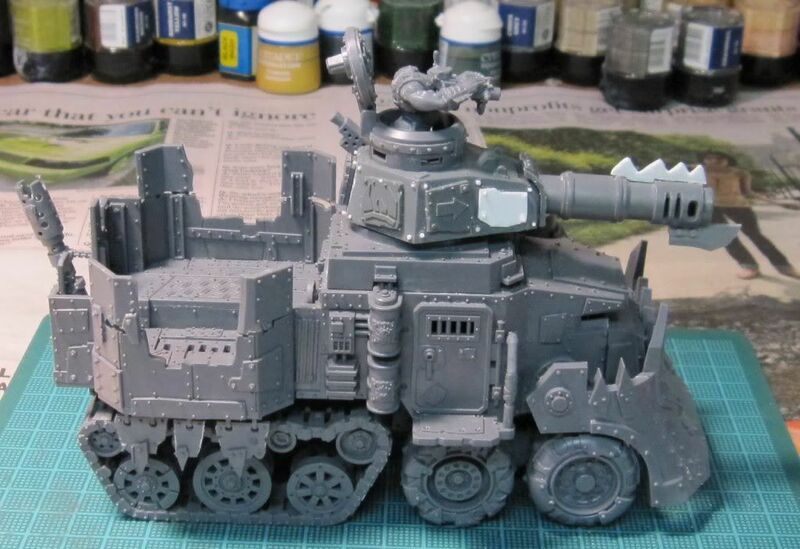 Orks are by far my most favorite WH40K army and they are also my second oldest army. 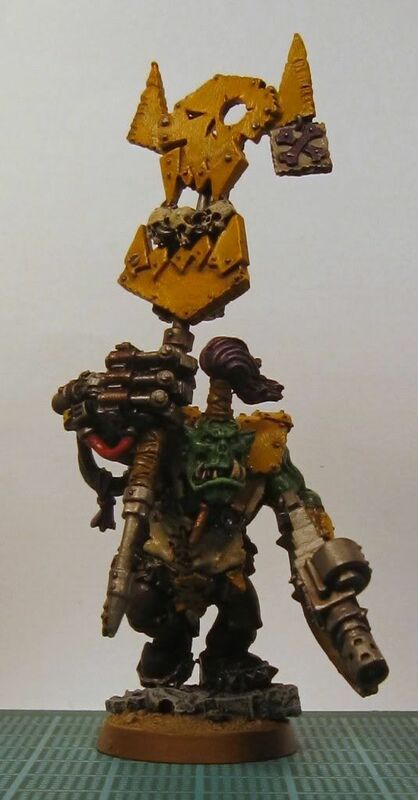 I just love everything about the orks (ok, except that they are fungal spores, but I ignore that when I can). I love the way they play and I love the endless modeling possibilities they offer. 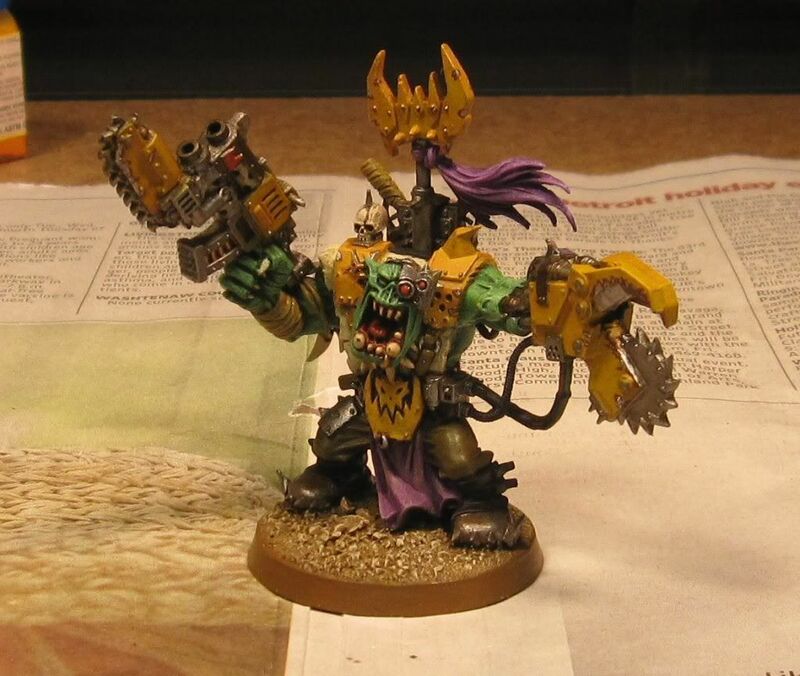 My first orks came from the 2nd edition WH40K boxed set (the plastic Goffs and Gretchin) and I instantly fell in love with them. I played them in 3rd edition, but I never played them in 4th edition. I even owned a copy of GorkaMorka, although I never found anyone to play it with. 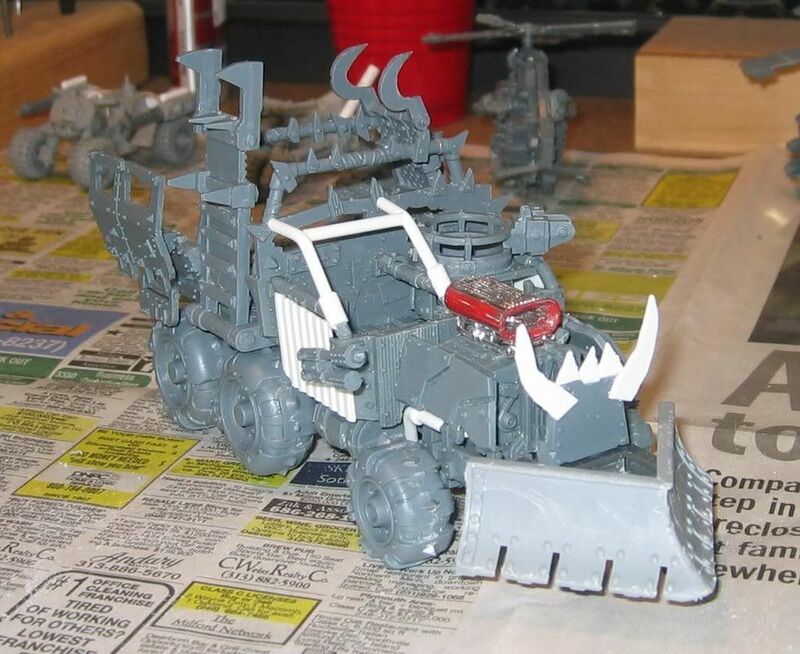 When I got into 5th edition, Orks were the first army I wanted to play. The new codex had come out a few months before and my army needed some updating, plus there was lots of new models to play with. 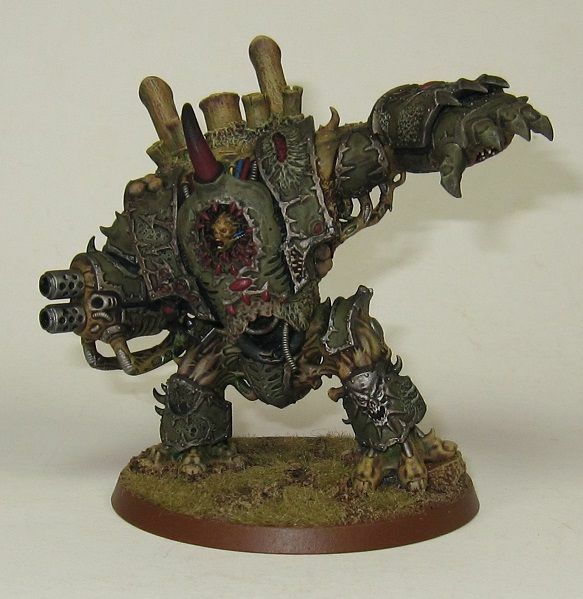 When playing my daemon army, I always squeeze in a unit of Beasts of Nurgle. This is a unit that I see get bashed quite a bit for its randomness, but I find them particularly useful. While they are Slow & Purposeful, their high toughness, two wounds, eternal warrior, invulnerable save, and Feel No Pain means they can take a lot of punishment and still survive. And with being Fearless, they will not break and run away if they take a lot of casualties. This makes them good for contesting enemy held objectives. In an assault, the random poisoned attacks can be a blessing or a curse. If a unit of seven beasts gets to assault another unit and rolls a 6 for the number of attacks (something that has personally happened to me three times now), that totals a whopping 49 attacks when you include the bonus attack for assaulting! Combine that with the poisoned rule (always wounding on a 4+, and re-rolling wounds against T4 or less) and you can have a real powerhouse unit. But you will have to take the roll of a 1 attack each when it comes up, and trust me, it will. 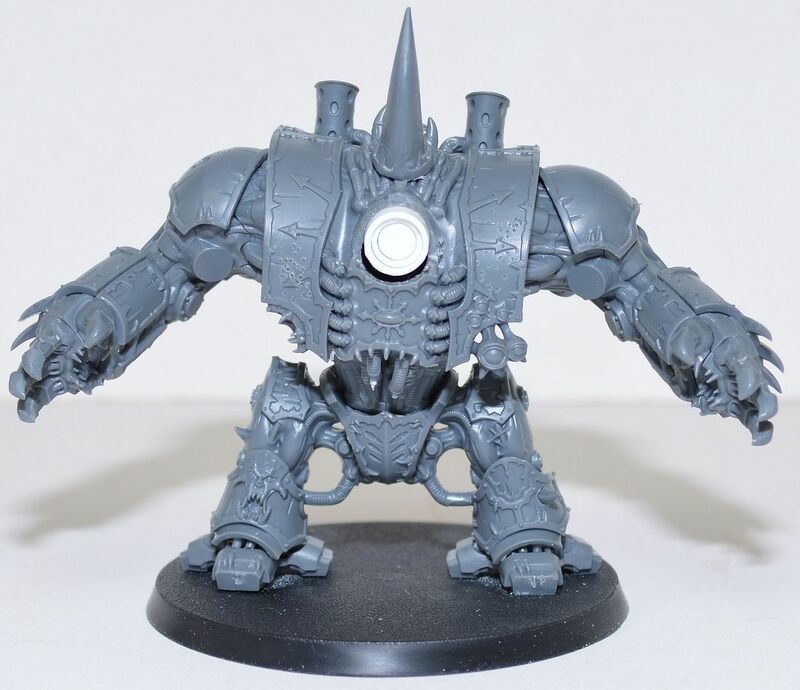 If the beasts do not kill all the enemy models in the unit they are in an assault with, it is likely that they will tie that unit up for a while. 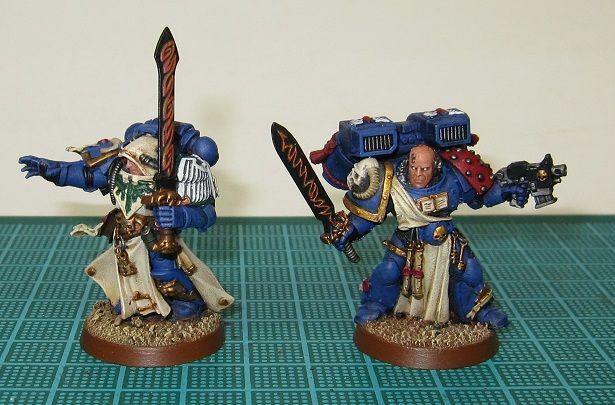 In the twelve games I have played with them, there were only two or three games when the unit was not still on the table at the end of the game, and one of those was a Deep Strike mishap where they were lost. Overall, I find them a must take unit. 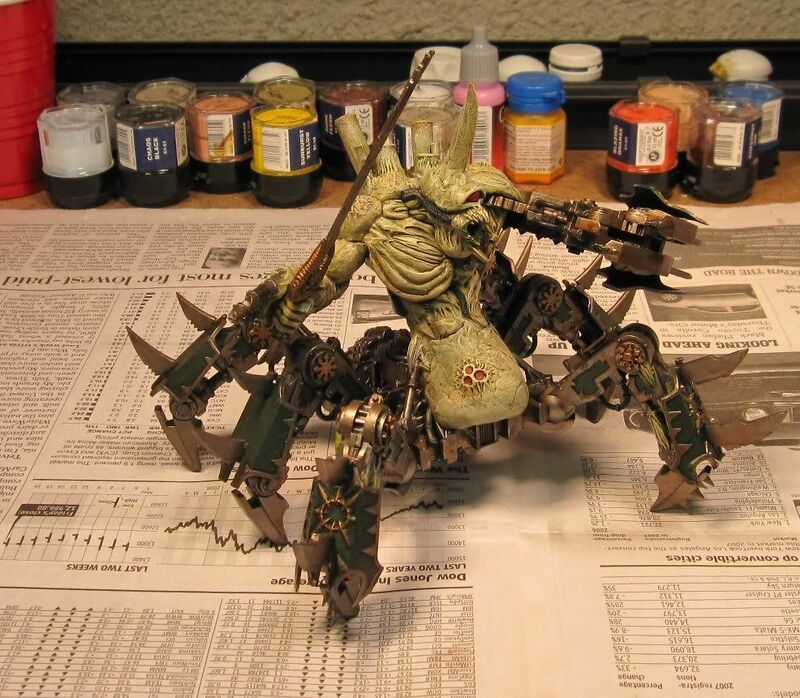 My daemon army focuses heavily on Nurgle daemons, though I have daemons from all four chaos powers. 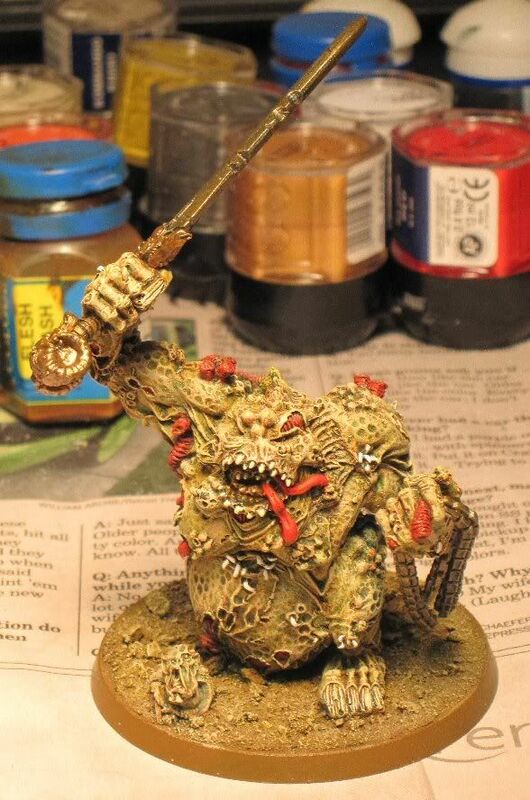 Papa Nurgle has always been my favorite. 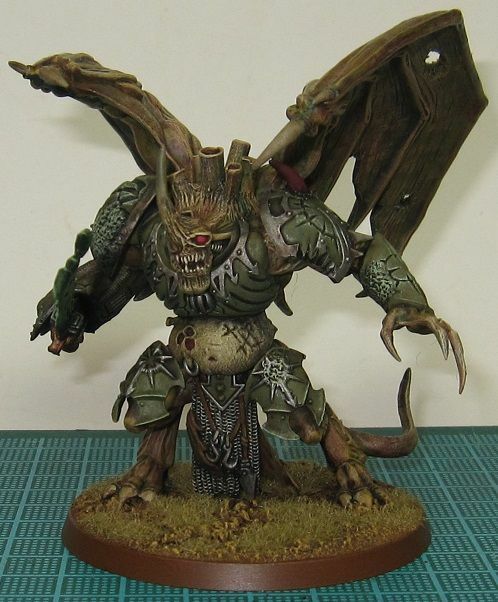 The origin of my daemon army dates back to 5th ed. 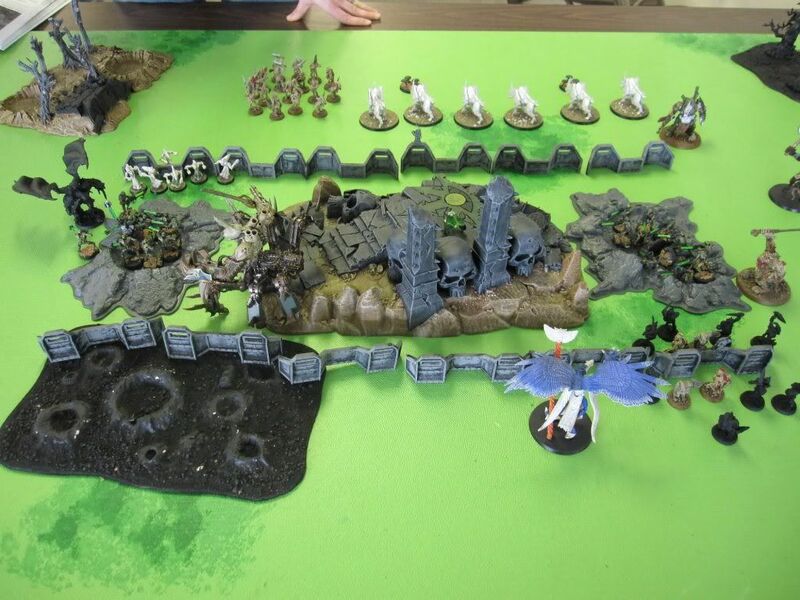 WFB when I played a Chaos Army. That was when there was only one army list, not three like there are today. 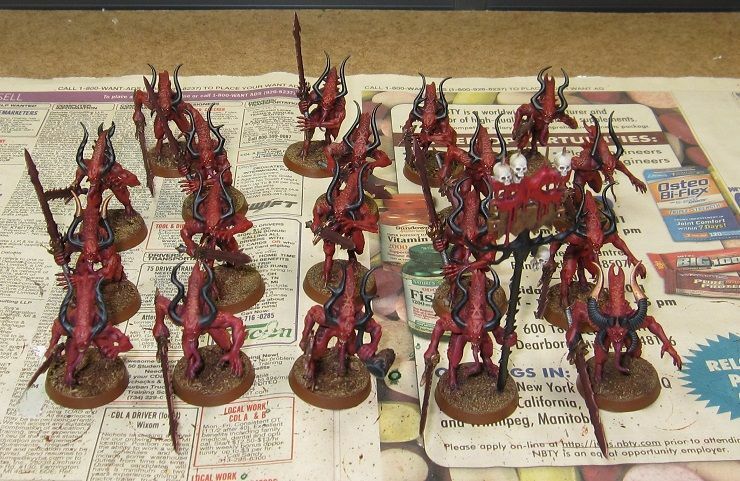 That army consisted mainly of Chaos Warriors, but I did collect some daemons and used them from time to time. 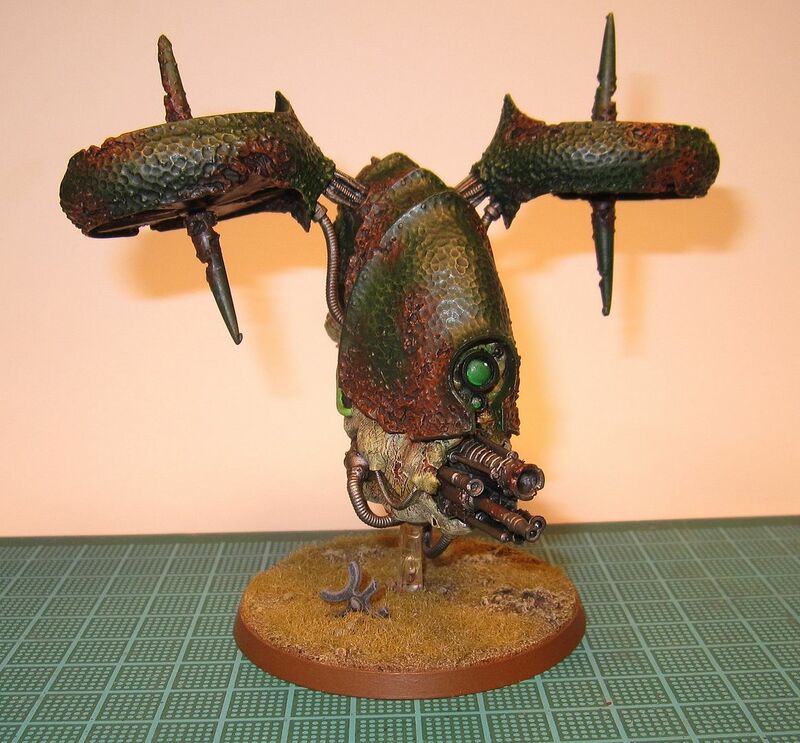 I have also used my daemons in Chaos Space Marine armies through the years. 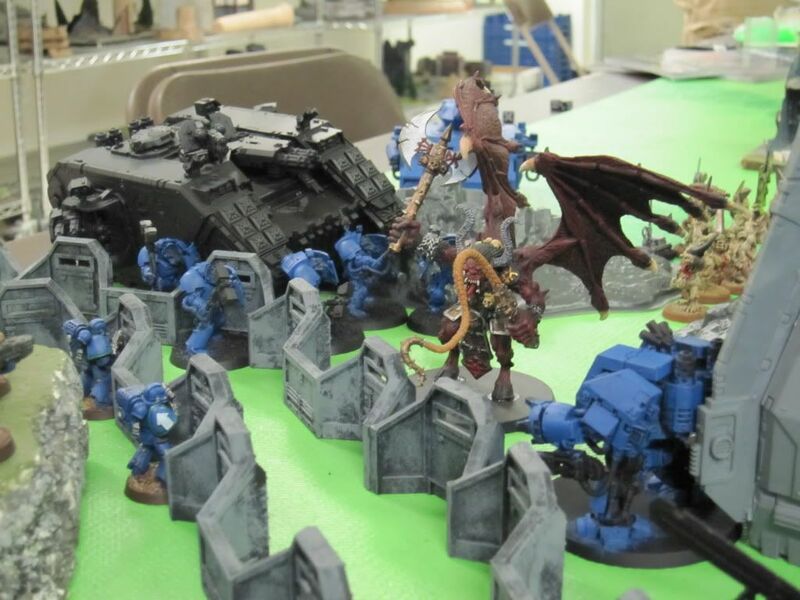 It wasn't until Sept 2009 when I joined a Tale of Four Gamers (ToFG) through the local chapter of the 40k Fight Club that I started assembling my daemons into a playable 40k army.